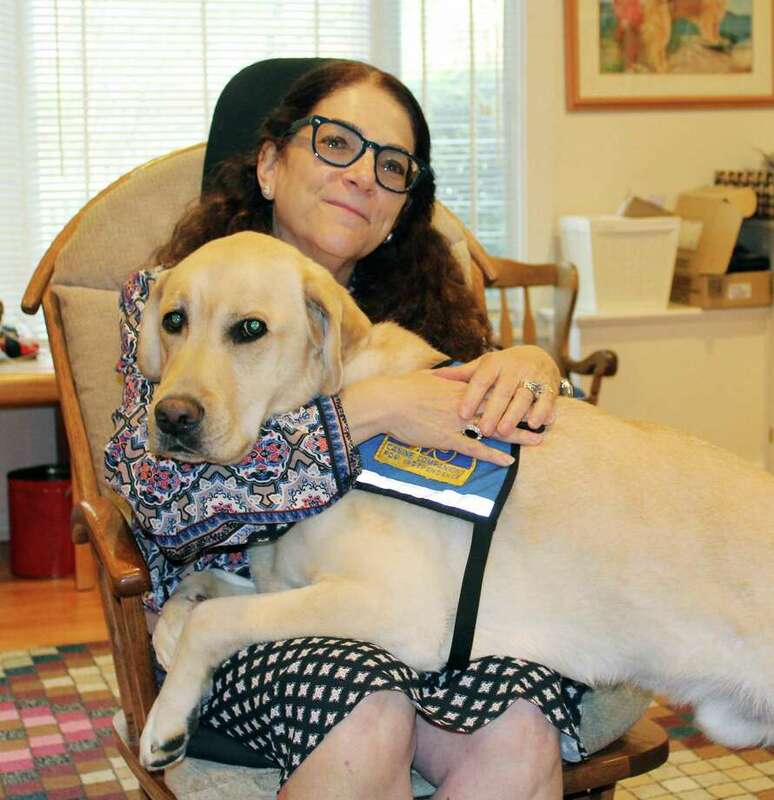 Psychologist Nancie Spector with her facility dog Robert at her home office in New Canaan on Nov. 9. It was April 15, 2013, the first time I felt I couldn’t escape the news. On that day, two men detonated homemade bombs at the Boston Marathon finish line, less than one mile away from my college dorm. In the week that followed, I couldn’t go to class without seeing tanks stationed across the street at the Boston Common. TV news was constantly playing in the common room, often with anchors speculating or reporting news that turned out to be false. I remember being exhausted all the time that week, feeling like the only time I could escape what was going on was when I was asleep. Though my circumstances of being so close to a terror attack were unique, I’m not alone in my inability to escape the news. According to Pew Research Center, nine out of 10 adults get their news online, meaning reports of stories like the 378 mass shootings that have been reported in the United States this year. All the negative news can start to take a toll on consumer’s mental health. Spector said she’s seen clients so focused on the news that they listen to it on a speaker pillow throughout the night. This focus can lead to stress and anxiety. However, Spector said there are tips people can take to avoid being overwhelmed by the news, especially in wake of incidents like the Las Vegas and Sutherland Springs shooting. An issue Spector sees in adult and children is the struggle is not falling victim to the anxiety that comes with seeing what seems like constant news of shootings and violence. After the marathon bombings, I found myself nervous when I went out in public, wondering if another attack was going to happen when I was at the movies or out to eat. Spector said she saw similar fears in her young clients, especially after Sandy Hook. While it’s easy for adults and children alike to fall down a rabbit hole of “what if” thoughts, Spector said it’s important to keep in perspective that these things don’t happen all the time. She also encourages to embrace the fact that we can’t control what does happen around us. Spector’s number one trick to staying sane in wake of a barrage of depressing news? Simple: limit your exposure. She also recommends sleeping well, eating well with lots of protein and exercising outdoors. “In the long-term, I talk to everyone about self-care,” she said, emphasizing the importance of engaging in mindful, restorative activities like meditation, prayer and leaning on a social support network. The same limit on exposure applies to children. Spector recalls that when 9/11 happened, she had children who didn’t know what happened. Nowadays, she said that would never happen. She recommends parents limit their children’s exposure to the news, avoiding activities like listening to it in the car, so that way they have time to hear bad news beforehand and prepare to discuss it with their young ones. “I want people to be able to process it themselves and think clearly about how they’re going to present it,” she said. However, Spector acknowledged there are some people who have to watch the news. Sexual assault survivors, minorities and undocumented immigrants are just a few groups of people who have a stake in what’s happening in the news and don’t always have the luxury of being able to turn out. As a reporter whose livelihood depends on being in the know, I had similar concerns and questions about how to get that separation. Spector suggests for those of us spending our days in a newsroom, or those that need to stay on top of policy changes that affect them, to focus on getting in a good mood before being exposed to potentially upsetting reports to help reduce the amount of stress hormones our bodies create. Others see bad news and are inspired to take action. Spector encourages activists, whether they’re writing letters to legislators or organizing marches, to take time for self-care and avoid getting sucked into the wormhole that is social media battles.